The second album from Passion Pit is beautiful, personal, and excellent. Three years after their stellar debut Manners, Passion Pit finally returns with Gossamer, an album that manages to be even better. It's a fantastic pop album from start to finish that is a joy to listen to. However, the ear candy hides the fact that this is one of the more intensely personal albums you'll ever hear. This is what makes it one of the best albums released in 2012. 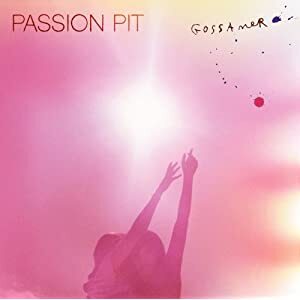 Everything on Gossamer is a step above Passion Pit's previous album. The most notable upgrade is in the vocals of mastermind Michael Angelakos. His signature falsetto remains but it sounds more polished. The moments where it came close to being annoying are long gone. While there are no children's choirs to be found on this release, there is plenty of variety. "I'll Be Alright" is a frantic combination of synths, drums, and some high-pitched vocal snippets. "Two Veils To Hide My Face" is a beautiful a capella interlude. Album highlight "Constant Conversations" is essentially an R&B slow jam. Beneath all the wonderful, catchy rhythms to be found are the album's true strength: the lyrics. The lyrics are in complete contrast to the light, cheerful sounds of the music. Michael Angelakos's troubles are documented and on Gossamer, he uses his pen to get everything off his chest. "Love Is Greed" has a cheery, happy feel to it musically...and some cynical observations: "Love has always been a mockery / Of those in love and scared to be lonely...."
"I'll Be Alright" deals with the moment when you feel a loved one is better without you: "Well I've made so many messes / And this love has grown so restless / Your whole life's been nothing but this / I won't let you go loveless...." Album closer "Where We Belong" deals with suicide: "Who says you ought to stay? / How's this the easier way?" Gossamer may very well be one of the truest examples of an album being excellent on multiple levels. This is an album that sounds great when played loudly on a home or car stereo. It is fun to listen to and there are several catchy, sing-along moments. Listen deeper and realize that this is far from a "feel good" album. An artist has put himself out there in ways that you don't see very often. Such catharsis can be freeing and start you on the path to happiness. Maybe that's why the contrast between music and lyrics doesn't seem so unusual after all.